Tailor-made services offered by The Royal Falcon Group range from representation of clients at trade fairs up to assistance for establishing a new business entity. We also offer to you Consultancy services for various projects worldwide like Construction projects, Trading activities, Investment Consultancy, etc. The projects under-taken by the Group with its long experience of strategic planning and specialisation in implementing small as well as large projects, bear the quality of such experience & expertise. 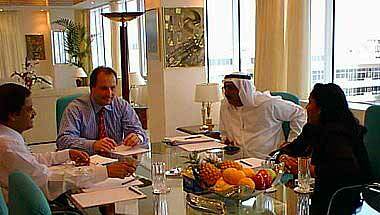 The Royal Falcon Group is a Government of Dubai approved business licensee. It has specialised in International Trade as well as Financial Consulting, which includes developing of concepts, structuring of projects, bringing the right resources together and make it happen.